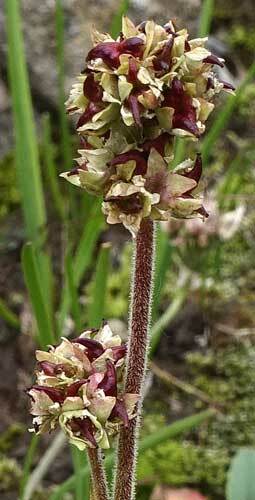 The species on this page are sometimes placed in the Saxifraga genus, sometimes in the Micranthes genus. 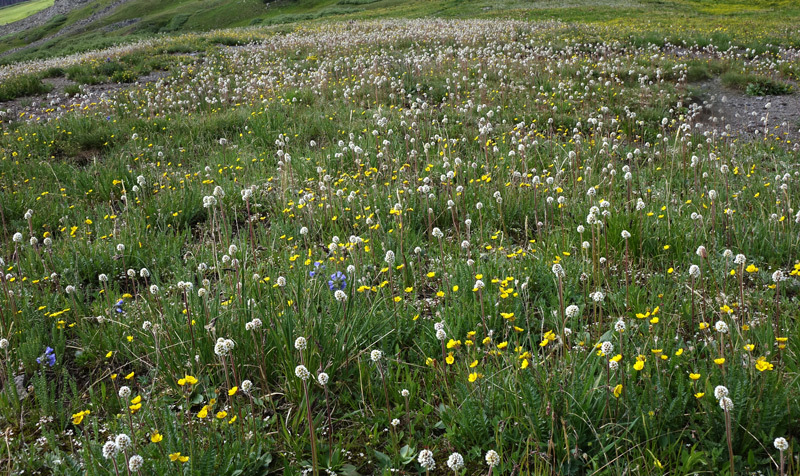 Colorado flora expert, William Weber, places them in Micranthes indicating that Micranthes species have only basal leaves, whereas Saxifraga species have leafy stems. John Kartesz, ultimate authority for plant names on this web site, also places the three species shown on this page in the Micranthes genus. 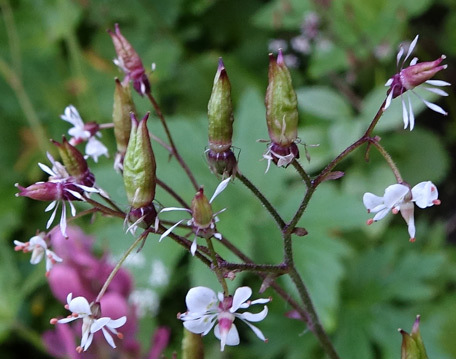 All three species are also, of course, members of the Saxifrage Family. 1) Saxifrage Family members often grow in rocky, stony areas. The distinctive, shiny, scalloped leaves of Brook Saxifrage are very common and evident in and along mountain streams. The flowers are minute works of art. Flowers are numerous and droop on branching ends of foot tall, slender, leafless stems. In 1907 Charles Piper ((1867-1926) named this species Saxifraga odontoloma from specimens collected in the Cascade Mountains in 1893 by Sandberg and Leiberg. Amos Heller ((1867-1944) renamed the species Micranthes odontoloma in 1912. "Odon" is Greek for "tooth" and "loma" is "fringe", both probably referring to the leaf margin. Bridal Veil Falls Trail above Telluride, August 10, 2015. Montane, subalpine, alpine. Marshy areas, tundra. openings. Summer. 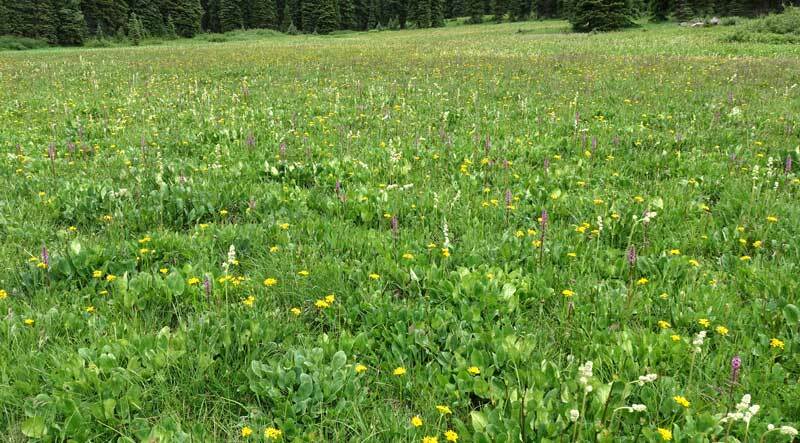 Grand Mesa, July 12, 2017 and Cinnamon Pass, August 1, 2007. Micranthes oregana is uncommon in the immediate Four Corners area, occurring only in San Juan County, Colorado and then it appears again farther north in Mesa County. Micranthes oregana is an elongated, multi-flowered version of the very common Micranthes rhomboidea which occurs in every county in the Four Corners area. 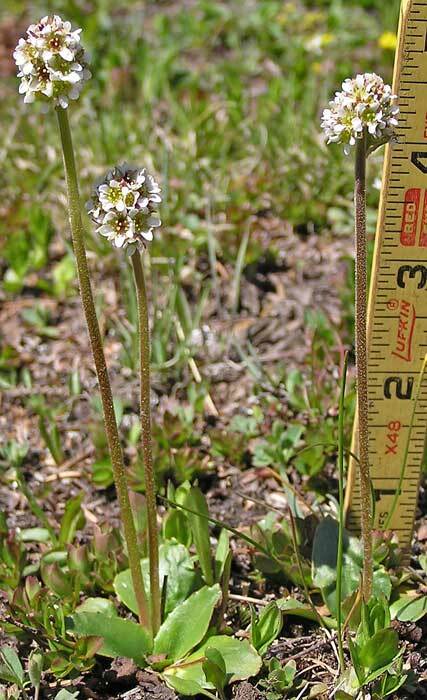 Micranthes oregana occurs in marshy areas and can grow to over two feet tall, at least two or three times the height of Micranthes rhomboidea. 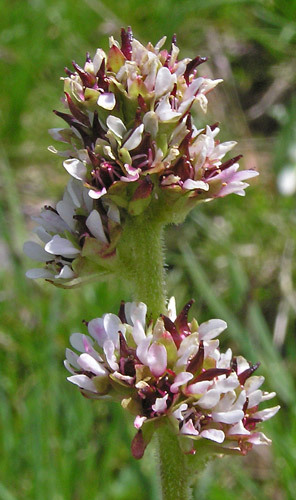 Stems are covered with fine white hairs tipped with bulbous glands; basal leaves are large (to 8" long and 3" wide), fleshy, and slightly toothed; flowers are in several clusters near the top of the stem. Frederick Coville and F. Funston collected the first specimens of this plant near Mt. 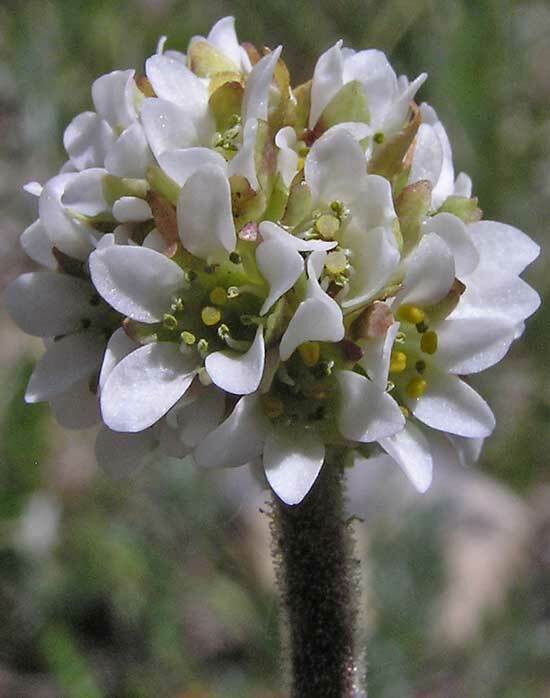 Whitney in 1891 and named it Saxifraga integrifolia. 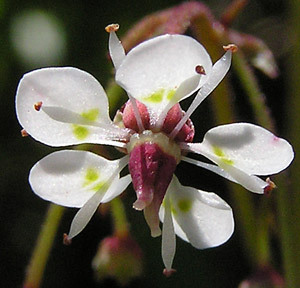 Thomas Howell renamed the species Saxifraga oregana in 1895, and John Small renamed it Micranthes oregana in 1905. Left: Grand Mesa, July 12, 2017. Below: Cinnamon Pass, August 1, 2007 and Lake Hope, July 31, 2017. Montane, subalpine, alpine. Tundra, rocks, openings. Summer. Micranthes rhomboidea’s snowball flower clusters on a slender stalk are most commonly and easily seen scattered, sometimes abundantly, on alpine ridges and high meadows. 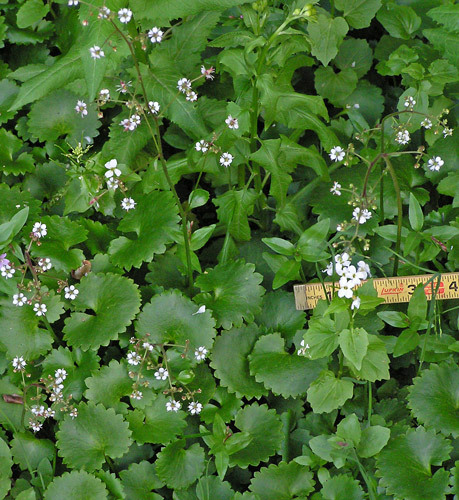 At lower elevations this Saxifrage is easily lost in other foliage. Snowball Saxifrage might be mistaken for Bistorta bistortoides. 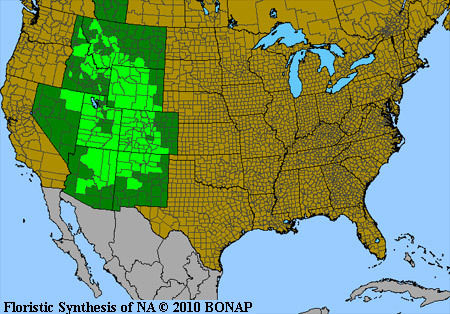 1) M. rhomboidea typically grows 5-7" tall (maximum 12"); M. oregana typically grows 12-25" tall (maximum 40"). 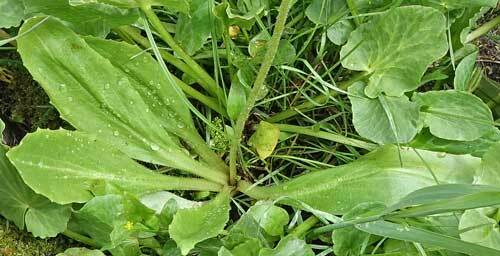 2) M. rhomboidea has diamond-shaped basal leaves to 2" long; M. oregana has oblanceolate basal leaves to 8" long. 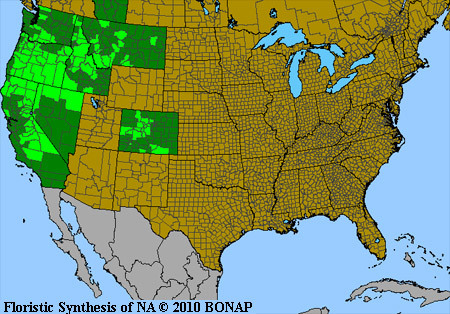 3) M. rhomboidea grows in dry meadows; M. oregana grows in wetlands. 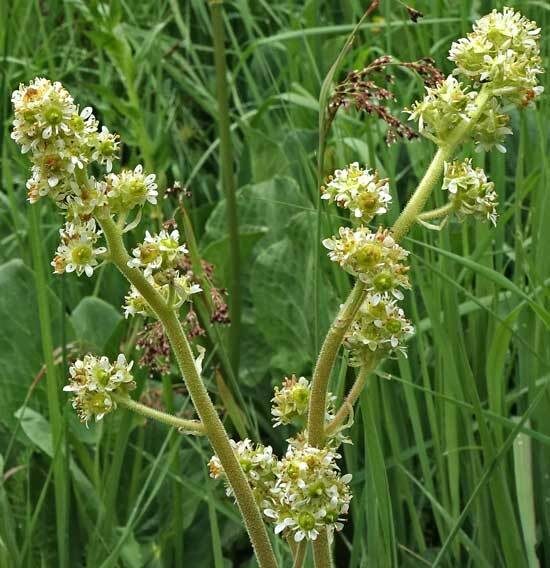 4) M. rhomboidea typically has just one rounded cluster of flowers per stem; M. oregana has several clusters per stem. In 1889 Edward Lee Greene collected the first specimen of this lovely plant for science on San Francisco Mountain in Arizona. 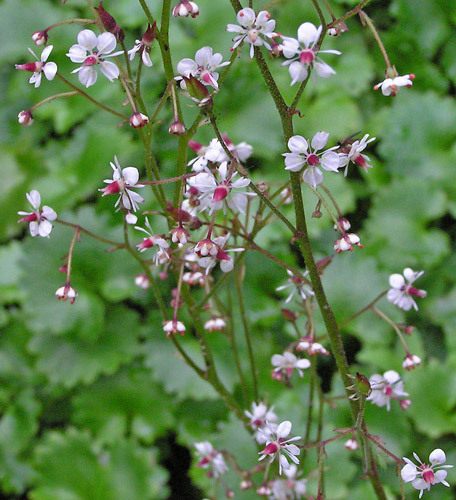 He named it Saxifraga rhomboidea in 1898. John Small (1869-1938) renamed it Micranthes rhomboidea in 1905. Left: Sharkstooth Trail, June 28, 2007. Top photograph: Micranthes rhomboidea on high and relatively dry tundra on the Colorado Trail near Stoney Pass, July 15, 2015. Bottom photograph: Micranthes oregana white/yellow stems projecting above a flower-covered wetland on the Crag Crest Trail, Grand Mesa, July 12, 2017.